Hohn and Hohn, Inc. has created spectacular tile installations for over 20 years. Proprietor Jan Hohn and her staff are passionate about tile, its versatility and seemingly limitless choices. They willingly work with clients, contractors, architects and designers to achieve the desirable tile installation. They work with natural stone, marble, granite and ceramic. They are also well-equipped to restore, clean or repair damaged tile and grout by regrouting or recaulking. Consider Hohn & Hohn, Inc. for your next tile adventure. 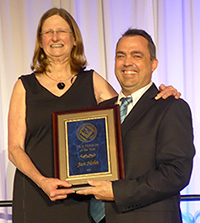 The NTCA recently awarded Jan Hohn with the 2014 Tile Person of the Year Award. Jan is only the third woman to receive this award during the six decades it has been presented. Read about Jan Hohn's national award here. Jan Hohn was awarded NTCA’s Five Star accreditation as one the top installers in the United States. She and her lead installers are Certified Tile Installers per the Ceramic Tile Education Foundation. Hohn & Hohn, Inc.'s work has won numerous awards, including the 2010 Tileletter Stone Special Recognition Award for a marble bathroom installation and the 2011 Tileletter Grand Residential Award for a breakfast room floor installation. Hohn & Hohn, Inc. currently holds an A+ rating from BBB. Check us out in the St. Paul Pioneer Press!